You just can’t get much easier than this. If you want a really tasty fluffy vegan cream, this is the one! You won’t believe it until you taste it! * Without shaking the can, open the lid and scoop off the heavy cream, leaving the water liquid in the can, an put into a high speed blender or mixer. * Scoop out and keep chilled. 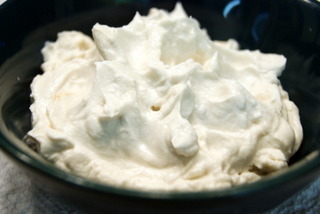 * A delightful soft and creamy topping for most desserts.